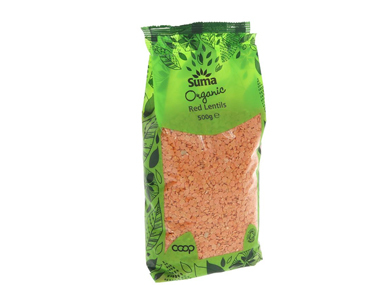 Buy Suma Organic Dried Red Lentils 500 grams in the UK from our online shop or directly from our independent Scottish store. Organic red lentils are hugely popular and versatile, used in soups, casseroles and curries. Also a source of minerals. Fun to make with children. Enjoyable to eat! This recipe contains 100 g red lentils. You can add meat to this dish, but the lentils are sufficient as a meat replacer. They are high in protein, fibre and iron and a range of different vitamins and minerals. Low in cholesterol and low in calories, lentils are a indeed a very healthy replacement for meat. This recipe contains 200g dried red lentils. A brilliant recipe from Bute Island Foods. Healthy, seasonal and suitable for vegetarians and vegans. Great for barbecues too! This recipe contains 250g lentils. If you use the products listed you can be certain they are vegan and gluten free (although might have been processed in a factory which also uses gluten and dairy). Other brands are available, but always read the label to make sure it doesn’t contain ‘hidden’ ingredients. This recipe contains 400g Suma dried Red Lentils. October can be cold too and this soup is a good way to warm up and also to use up the pumpkin! Serve it with your homemade chutney made in September. This recipe contains 100g red lentils. Dahl is an important part of Indian cuisine and often eaten with rice and vegetables. It’s a very healthy way of getting enough protein in your diet and red lentils also contain lots of fibre and vitamin B, essential for a proper nervous system. This recipe contains 300g dried red lentils. A super simple, healthy vegan soup made with seasonal pumpkin and red lentils. This recipe contains 100 g red lentils. A vegetarian recipe, serve with potatoes and pickled vegetables or sauerkraut for a seasonal dish. This recipe contains 350g red lentils. As official Suma stockist, we sell genuine Beans & Pulses directly from our shop in Scotland and online throughout the UK. Where can you buy real Red Lentils - Organic safely online? If you are wondering where you can buy Suma Organic Dried Red Lentils 500 grams safely online in the UK, then shop with us. We are an actual health foods shop; with real people selling real foods and products. Our award-winning independent shop is located in Stirling, Scotland since 1976. You can buy our Beans, pulses, grains, flours, seeds and dried fruit and other genuine Beans & Pulses in store or safely place an order with us online or over the phone. Red Lentils - Organic - Suma Organic Dried Red Lentils 500 grams in Beans & Pulses and Foods.